EDITOR’S NOTE: Our thanks to reader “Tony” for pointing out the video described below. The video has a publication date of July 17 and appears to be a bid by an affiliate of the Empower Network MLM “program” to target traffic meant for CashCropCycler and refocus it toward Empower Network. “President Obama” appears to speak with a British accent in the promo, which also features a jab against Ben Bernanke, the chairman of the Federal Reserve. 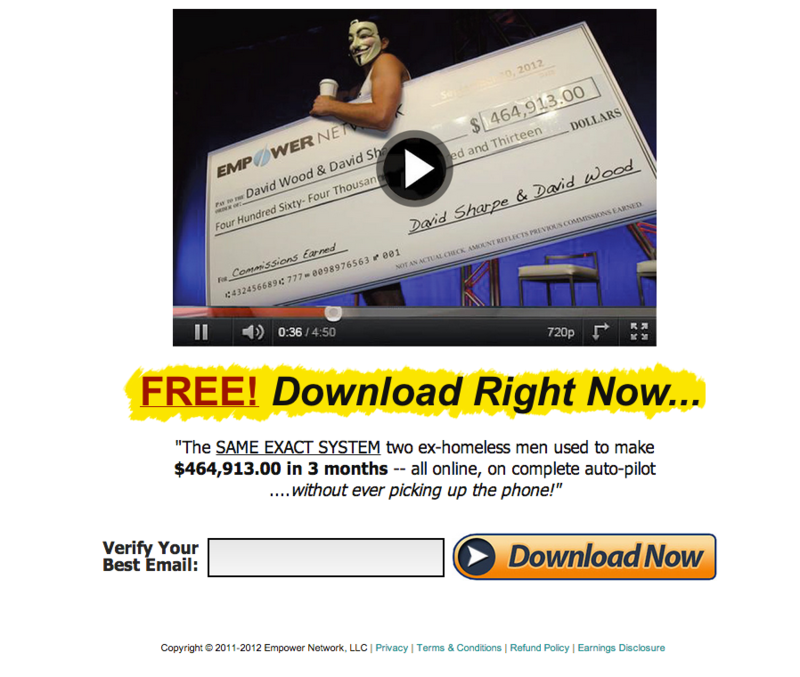 A URL below the video at the YouTube site goes to a page at JoinVicNow.com that displays a photo of an oversized “Commissions Earned” check from Empower Network for $464,913. The check appears to be dated September 2012. It is made out in the names of “David Wood & David Sharpe” and is presented by an individual wearing a Guy Fawkes mask. CashCropCycler, a “program” promoted on the Ponzi boards, appears to have gone missing in recent days. NEOMutual, a purported “crowdfunding” company promoted alongside CashCropCycler on the Ponzi boards, also appears to have gone missing. Both “programs” planted the seed that extraordinary profits would come to enrollees. The Guy Fawkes mask sometimes is known as the “V for Vendetta” mask, which sometimes is used by members of “Anonymous,” the so-called hacktivist group associated with DDoS attacks on government and commercial sites. The Guy Fawkes mask is a stylised depiction of Guy Fawkes, the best-known member of the Gunpowder Plot, an attempt to blow up the House of Lords in London in 1605. The use of a mask on an effigy has long roots as part of Guy Fawkes Night celebrations. 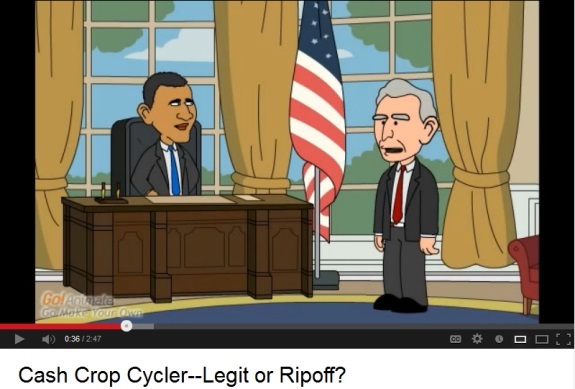 After Obama replaced Bush in the White House, an affiliate of an MLM “program” known as MPB Today depicted Obama in a 2010 promo as a left-handed saluting Nazi subordinate to then U.S. Secretary of State Hillary Rodham Clinton, who was depicted as a whining drunk who’d knocked out First Lady Michelle Obama in the Oval Office. In 2012, MPB Today operator Gary Calhoun was charged in Florida with racketeering. A federal forfeiture complaint that targeted the headquarters building used by MPB Today specified the crimes of access-device fraud and fraud in connection with identification documents. In January 2013, an online promotion turned Obama into a pitchman for a Ponzi-board “program” known as UltimatePowerProfits. One promo for TelexFree claims a payment of $15,125 to the MLM firm will produce a profit of more than $42,000 in a year. The “Aunt Ethels” of the world — older people with money — will become keen on TelexFree, according to the promo. Rather funny that this is such a big deal. No-one complained when the rodeo clown dressed as president Bush. Guess that didn’t diminish the presidency. Good grief, people can’t even jokee anymore.